Are these voters automatically “micro” or “minor” party voters? Are they “protest” voters who wouldn’t vote for Labor or the Liberals in a fit? Are they voters who only make up their minds when they see the ballot paper? Keeping the numbers down that contest elections can be achieved in a myriad of ways. That bill had another change that may act to reduce the number of political contestants. One of the barriers to entry any party or candidate faces in contesting elections is the nomination fee. The purpose of a nomination deposit is primarily to deter frivolous candidates. There was no evidence that the nomination deposits then current were too low. There was no evidence either that existing nomination deposits were so high as to deter serious candidates. Notwithstanding, the Electoral Integrity bill raised the candidate nomination fee for the House of Representatives from $350 to $500, and the Senate candidate nomination fee from $700 to $1,000. For minor political parties seeking to contest elections nationally, the cumulative cost of nomination fees represents a high barrier to participation. If a political party stands 150 Lower House candidates that will now cost them $75,000 in nomination deposits. If they stand three candidates for every Senate ticket in eight territories and states, that will now cost them $24,000. Adding those two together, if a party completely covered the national election, it would cost $99,000. This is refunded if a party achieves 4 per cent, but there is no way every minor party and every group of independents will get 4 per cent in every electorate they stand in. Interestingly, Family First apparently did not see the danger. In a Senate division called on that vote, the Liberal, National, Labor and Family First parties voted for these higher nomination deposits and the Australian Democrats and Australian Greens voted against. 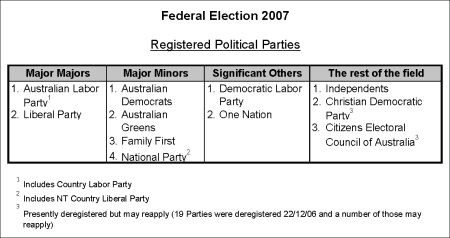 On the December 22, 2006, the Australian Electoral Commission announced its decision on registered political parties. Nineteen political parties were deregistered, but effectively this was 16 because a number of registered names were divisional repeats. These were: Christian Democratic Party (Fred Nile Group); Citizens Electoral Council of Australia; Citizens Electoral Council of Australia (NSW Division); Help End Marijuana Prohibition; Hope Party - ethics equality ecology; liberals for forests; New Country Party; No Goods and Services Tax Party; Non-Custodial Parents Party; One Nation Queensland Division; One Nation Western Australia; People Power; Progressive Labour Party; Queensland Greens; Republican Party of Australia; Socialist Alliance; The Australian Shooters Party; The Fishing Party; and The Great Australians. Any political party that is deregistered may re-apply for registration, and must comply with the current requirements in the Electoral Act, including the naming provisions. My expectation is that most of these parties will not re-register, and of those that do and are successful, they are not going to contest elections across every state or territory. Of course new parties may still be formed and successfully registered, even just as preference harvesting mechanisms. In theory 35 political parties were left registered, but in practice (because of separate registrations of state and territory divisions of the same federal party), there are only nine separate federal political parties left at present. 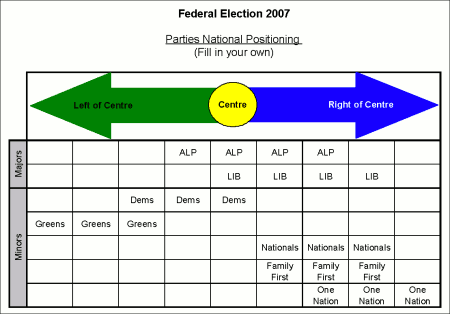 These are: Australian Greens; Australian Democrats; Australian Labor Party (and Country Labor Party); Democratic Labor Party; Family First; Nuclear Disarmament Party of Australia; Liberal Party; National Party (and Northern Territory Country Liberal Party); Pauline Hanson’s One Nation (NSW Division). Of these nine, the Nuclear Disarmament Party is not expected to contest the election, leaving eight main political brands in the race. Political parties have many of the same characteristics as branded goods - high name recognition and high exposure increase the chance of purchase. Of course, reputation matters, so a continuous stream of deliberately negative coverage can reduce the purchase intention. As does reduced or no media coverage at all. What are the chances of electoral success for these main political brands in 2007? Based on past elections, it seems unlikely that anyone other than the Liberals, Labor, the Nationals and a few Independents can win House of Representative seats, although there is always an outside chance of a minor party upset. (The Democrats came close in Mayo in 1998, and the Greens won Cunningham in a by-election in 2002). The Senate is a different matter. The Senate will be of much greater election interest than in the 2004 federal election because of widespread negative views generated by Coalition control of the Senate that resulted from that 2004 election. There will be considerable voter interest in whether the Coalition Senate numbers can be reduced below half, and which of the minor parties will then hold the balance of power when the Liberal/National Coalition and the Labor Senators are in disagreement on an issue. The Liberals and Labor are certain to win a swag of Senate seats and the Nationals and the Greens seem likely to win some seats, but the Democrats and Family First are considered outside chances, based on current senate polling. The chances of election success are materially affected by popular support, incumbency, money, media coverage and polling booth coverage. For political parties sufficient media coverage is vital, and any deliberately negative coverage is damaging. One intriguing question remains of where the parties and voters are in positioning terms. Brand managers will not only talk in terms of demographics but in terms of psychographics. Brand positioning covers both, and the critical matter is how buyers (voters) see themselves in relation to the brand. Despite its obvious limitations, the “left-right” description still has very wide currency. In politics many people will describe themselves in policy terms as in the “centre” or “centre-left” or “centre-right” but will actually vote for a party that is none of those. Positioning is a subjective matter. 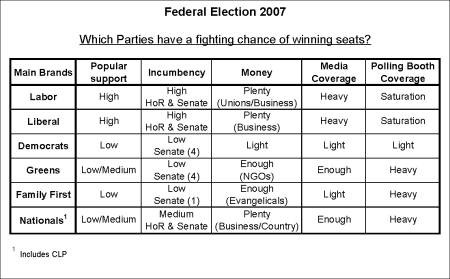 Below is my matrix for the main Australian political brands. Decide for yourself where you think the main political brands lie, and where you think your politics rests.